When new business owners hear the phrase “sales funnel” many of them either have no idea what you’re talking about or they think they don’t need one because they’re just starting their business. Sales funnels are important because it takes your customers on the journey of the buying process. Proper sales funnels will turn website visitors into email subscribers, and email subscribers into customers or clients. In today’s post, we cover the definition of a sales funnel, the phases a potential buyer goes through, what role marketing plays in your sales funnel, and who ultimately why you need sales funnels as a part of your business strategy. P.S. We’re sharing how to turn cold leads into warm leads! Sign up to the email form above so you don’t miss out! A sales funnel isn’t as intimidating as it sounds. Essentially, it’s the process potential customers go through to become customers. The word “funnel” is used, because of the shape of the funnel mimics the amount of people that go throughout the sales funnel process. The top of the funnel is the widest, because this is where the beginning stages of awareness occur, while the bottom is for paying customers. The goal is to funnel down your prospective customers into ones who are serious about purchasing. There are several phases of a sales funnel as you move further and further down the funnel. Below is a quick description of each phase. Awareness: Potential customers start to become aware of your products (example: blog readers who are looking for a solution to a problem they have). Interest: Potential customers start to become interested in your product (example: email subscribers). Evaluation: Potential customers evaluate your products compared to your competitors. Decision: Potential customers decide to make a purchase. Purchase: Potential customers become actual customers, success! Depending on what you’re selling, your sales funnel might be a longer process than others. Products and services that are larger in price might need a longer sales funnel and points of contact than cheap ones. Marketing is essential in nearly all phases of the sales funnel, but it is especially important in the beginning phases, particularly the awareness phase. Marketing your products online using social media and paid advertising is essential during the awareness phase because these are places where potential customers can find you and your products. 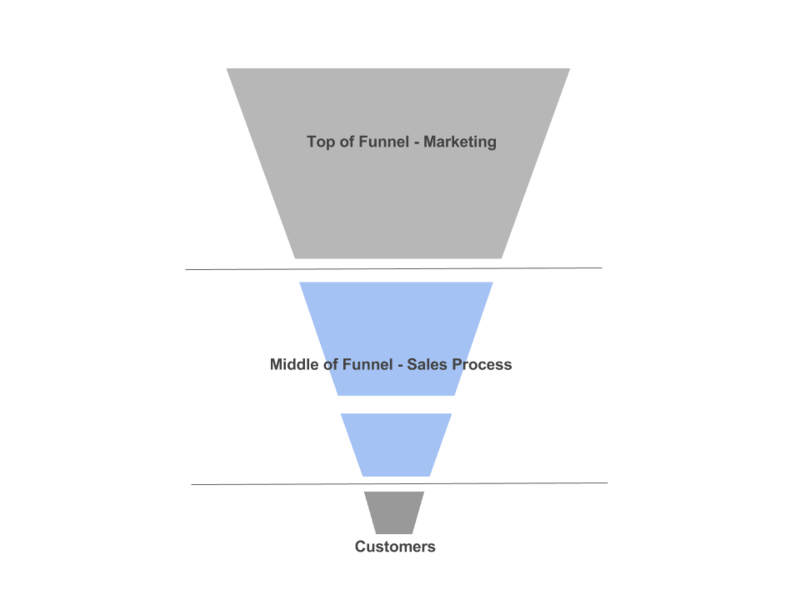 What types of marketing go with the phases of the sales funnel? Blogging is great for generating awareness of your product and business. You can share your blog post on other platforms such as Pinterest or Facebook. Opt-ins are great for generating interest toward your product. For example, we have a Getting Started Guide that leads people into a sales funnel to purchase one of our WordPress themes. Webinars are fantastic for getting those interested in your product to the decision & purchase stage. This is where you can pitch your product directly to those people that you know are interested. These are all just examples of how marketing can play a role within your sales funnels. You can obviously switch the marketing tactics around to fit your needs and decide what works best for you and your business. But in all seriousness, everyone who is selling a product or a service needs a proper sales funnel strategy. Without mapping out a sales funnel strategy, your marketing efforts may not get you aware because your potential customers are unclear as to what the next steps are in the purchasing process. You want to nurture your potential leads to the point where they realize they can’t live without buying your product or service. Having a set sales funnel (or multiple sales funnels) gives you the opportunity to not always be chasing the next sale, which is what we all want, right? Mapping out a sales funnel will help you be consistent with your marketing and helps you measure the progress you make in each phase. Measuring your progress is imperative because you can start to identify what phase people fall off at and start making adjustments. Great sales funnels build trust and credibility over time by providing incredibly valuable content. Gaining their trust will give your potential customers, even more, an incentive to buy from you. We hope this introductory post to sales funnels and what they are all about was helpful for you. A proper sales funnel is crucial to scaling your business successfully, while building authentic relationships with your potential customers. Stay tuned for next week’s post where we’re sharing how to start building your first sales funnel!